Volume 4 of The Churchill Documents begins with Churchill’s remarkable visit to East Africa in 1907 and his journey down the Nile. What then follows is his entry into the Cabinet as president of the Board of Trade, his courtship with and marriage to Clementine Hozier, his prominent part in the successful parliamentary and public struggle to curb the powers of the House of Lords, his work for prison reform as Home Secretary, his deepening involvement in defense matters, and his opening months as First Lord of the Admiralty. The correspondence relating to his journey through East Africa and along the Nile shows that he combined political action and reflection with a sense of adventure. On his return, his private life took a turn toward courtship and marriage. His correspondence with “my darling Clementine” weaves an intimate and revealing thread throughout the remaining document volumes. From the spring of 1908, Churchill was a full and active member of the British Cabinet, and remained so for seven years. These letters disclose how seriously he took his Cabinet responsibilities, and how fertile was his administrative work. He was at the forefront in challenging and destroying the power of the House of Lords to veto social legislation involving government expenditure. It was a prolonged and bitter battle that brought him in conflict with the Court. The prison reform correspondence reveals a humane and compassionate Churchill. He had also, as Home Secretary, to confront and suppress the riots and disturbances that followed the industrial unrest of 1910. His refusal to allow troops to confront the miners of Tonypandy, in South Wales, was denounced by his former Conservative colleagues as too lenient. With the Agadir Crisis of 1911, Churchill moved to confront concern for Britain’s weakness at sea. Recognising his patriotic zeal and practical abilities, Prime Minister Asquith appointed him First Lord of the Admiralty. The last pages of this volume follow his steps into this new responsibility. 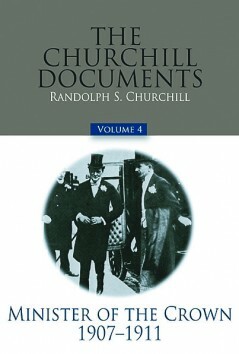 Randolph S. Churchill, the only son of Winston Churchill, was born on May 28, 1911. Educated at Eton and Christ Church Oxford, he became a widely read journalist in the 1930s, reporting at first hand on the German elections of 1932 and warning of Hitler’s military ambitions. In the 1930s he fought three vigorous but unsuccessful campaigns to enter Parliament. In the Second World War he served as an intelligence officer at General Headquarters, Middle East, and in the Special Forces in the Western Desert. In 1944 he volunteered to the parachute behind enemy lines to serve as a liaison officer with the Yugoslav partisans. For his war services, he was awarded the MBE (Military). For the five war years he was a Member of Parliament for Preston. He was three more times an unsuccessful candidate — in 1945, 1950, and 1951. Between 1938 and 1961 he edited six volumes of his father’s speeches. His own books include The Rise and Fall of Sir Anthony Eden; Lord Derby, King of Lancashire; The Six Day War, a history of the six-day Arab-Israeli war of 1967, written with his son, Winston; and the first two main and five document volumes of the biography of his father: Youth, 1874-1900 and Young Statesman, 1901-1914. A trustee of the Winston Churchill Memorial Trust and an Honorary Fellow of Churchill College, Cambridge, Randolph Churchill died at his home Stour, East Bergholt, Suffolk, on June 6, 1968.